Arizona Legislature recently passed Title 44 and included it into the Appliance and Equipment Energy-Efficiency Standards of the Arizona Revised Statutes. Within Title 44, there are new efficiency standards for residential pool pumps, pool pump motors and portable electric spas, which went into effect on January 1, 2012. The law applies to pump/motors that circulate and filter water for the swimming pool. Stand alone water feature pumps and stand alone pumps running floor head cleaning systems are exempt. What does this mean for pool owners? While it does not affect any pump currently installed on an in-ground residential pool, any newly installed pump that is 1 horsepower or greater must have at least a two speed motor, or a variable speed motor. In the case of a motor replacement by itself, as long as the existing pump is still in good shape, the single speed motor can be replaced with a two speed, or variable speed motor as a lower cost option. This will save you money by not having to replace the whole pump. Pumps with a two speed motor are also available. The best over all value however, comes from installing a variable speed pump. These new pumps, have quiet, brushless motors that use magnetism to spin the shaft and can be set to run at speeds between 600 RPM and 3450 RPM. Variable speed pumps provide the flexibility to choose a high and low speed that is appropriate specifically for your size pool and type of cleaning system. When properly calibrated, a variable speed pump uses up to 80% less energy than a conventional single speed pump. How can I save money and energy by upgrading my pool pump? 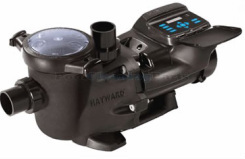 Variable-speed pool pumps have the ability to operate at a variety of speeds. I will determine the volume of water in your pool and the amount of water that must be filtered each day. The pump can be set to run at very low speeds, appropriate for your pool specifically, which in turn will conserve energy. Higher speeds can be used for shorter periods of time to run floor heads and bottom cleaners. By filtering the water slowly, over a longer period of time per day, you can save well over 30% on your current monthly pool electricity cost. Hayward's easy to use Energy Solutions Calculator can help you determine your estimated savings. Why does slowing down the water save on pumping costs? When using the low-speed mode of a variable-speed pump, the water moves slower and thereby reduces the friction in the system. Reduced friction decreases the back pressure and as a result, the pumps motor does not work as hard, which means less energy is used. With less friction and back pressure, it takes only a small amount of energy to keep the water moving through the pipes after the pump has been started. What is the benefit of brush-less motor technology on the new variable speed pumps and some multi-speed motors? Brushless motors are more efficient and require less power to run them. Magnetic motors run much quieter, as there is little to no electrical noise. The new magnetic motors have no brushes to wear out over time, or create excessive heat from friction. As a result, variable speed pumps last longer and run much cooler. Jason the Pool Guy is Certified by SRP to do calibrations and properly install Title 44 compliant equipment. See a full list of vendors including Jason the Pool Guy at SRP. Variable-speed pool pumps have the ability to operate at a variety of speeds and conserve energy. 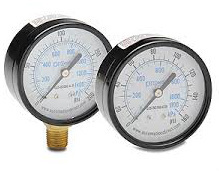 Use up to 80% less energy with a variable speed pump when properly calibrated.